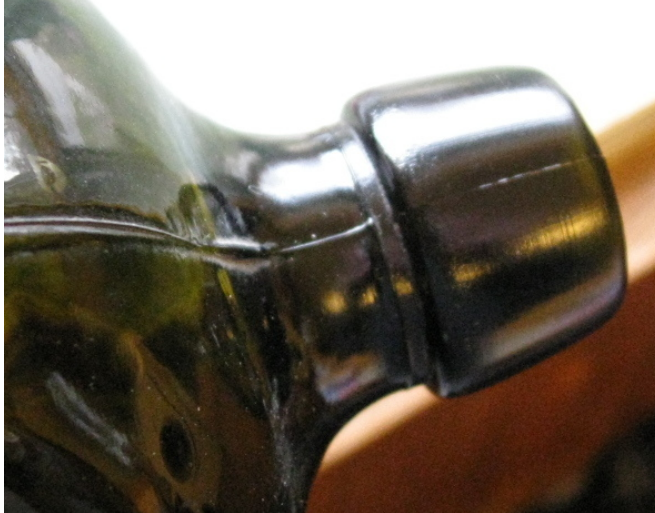 Antique scroll flasks are easy to spot thanks to their distinctive shape. While aqua is the most commonly found color by far, other brilliant colors (greens, ambers, blues) are not infrequently encountered and fetch top dollar by collectors. 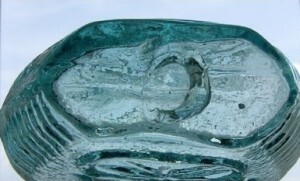 George and Helen McKearin described the scroll (or violin) flasks in their book, American Glass, in the 1940s with details on 51 different molds. This list was later expanded with many variants in American Bottles and Flasks and Their Ancestry. Often, the difference between molds for scroll flasks comes down to the precise placement and shape of embossed stars and other details. A group of scroll flasks in quart, pint and half-pint sizes. 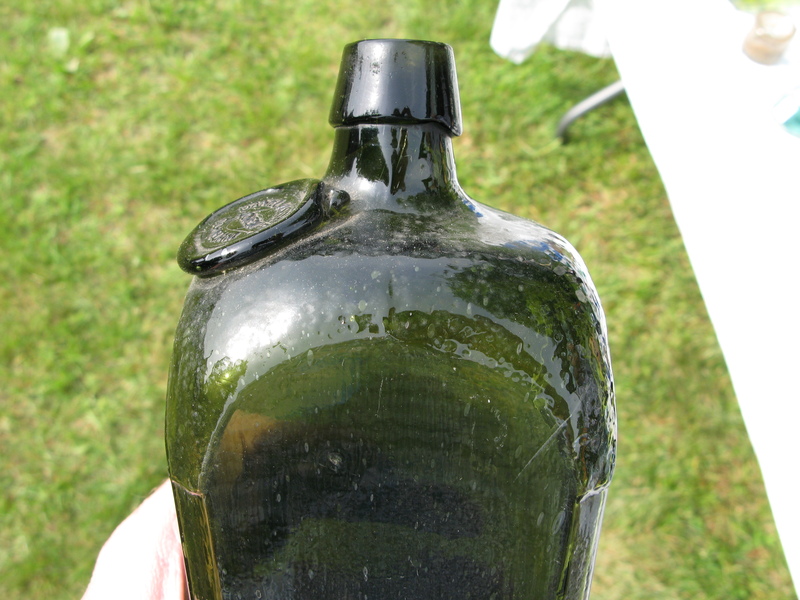 As with all historical flasks, the rarity of bottles of a particular mold is the greatest driver of value. Color follows closely; collectors pay significantly more for rare colors in any mold over a commonly found aqua example. 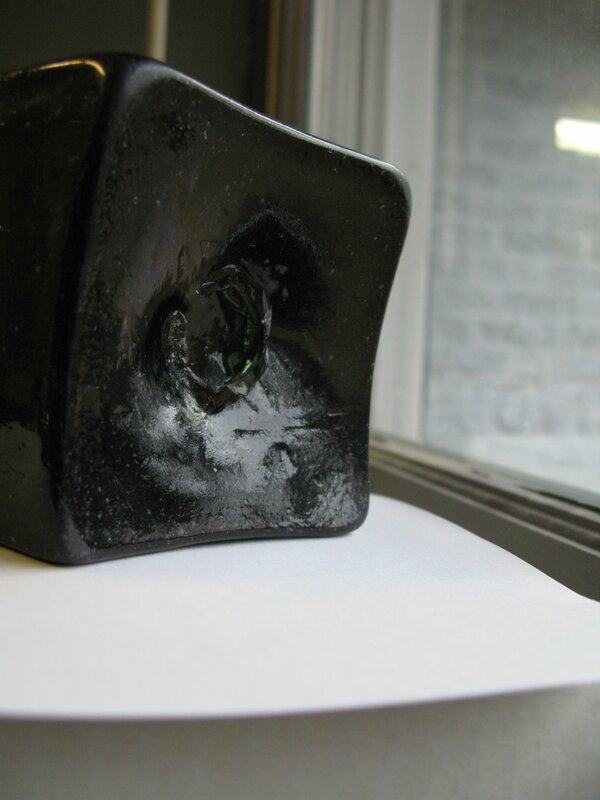 Condition is always a consideration – as we often point out here at Historic Glasshouse, even minor damage takes a big bite out of value. 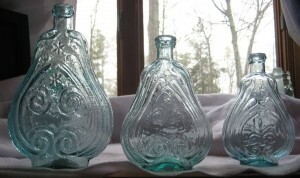 Scroll flasks were made by blowing hot glass into a two piece iron mold. 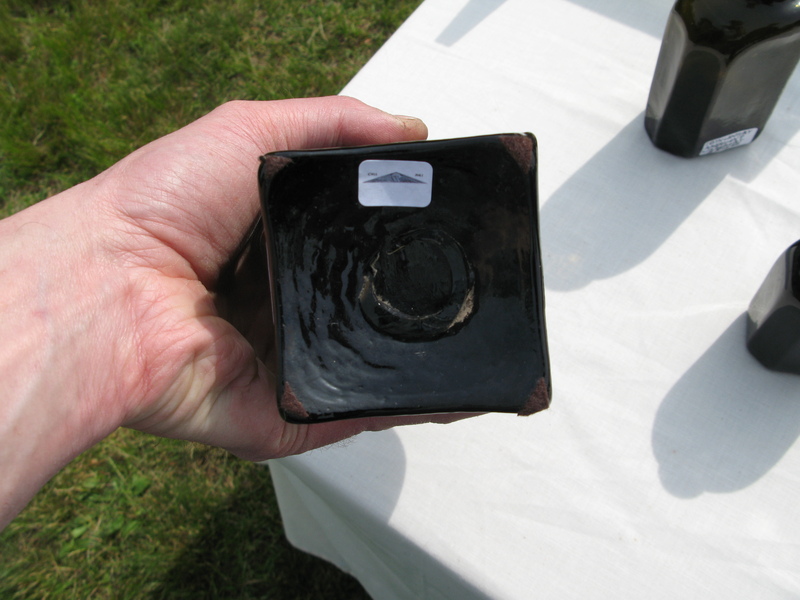 The hinged mold was then opened and the bottle was removed while still attached to the blowpipe. 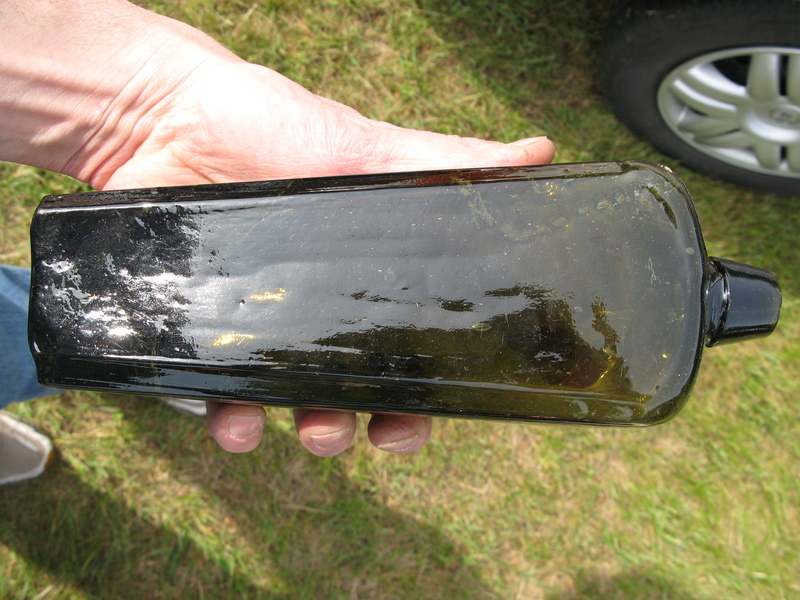 An assistant would then attach another rod (called a pontil) to the base of the bottle. The glass blower could then detach the bottle from its lip by shearing the still soft glass. Most often you will find scroll flasks with a plain sheared lip. 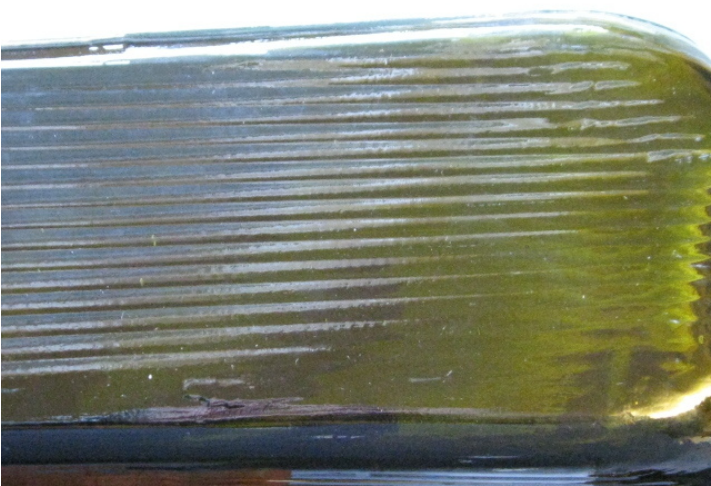 A sheared lip on a historical flask. Some flasks would receive additional work to finish the mouth and lip. Commonly found are the applied band of glass and, infrequently, an applied lip. See the group shot above. 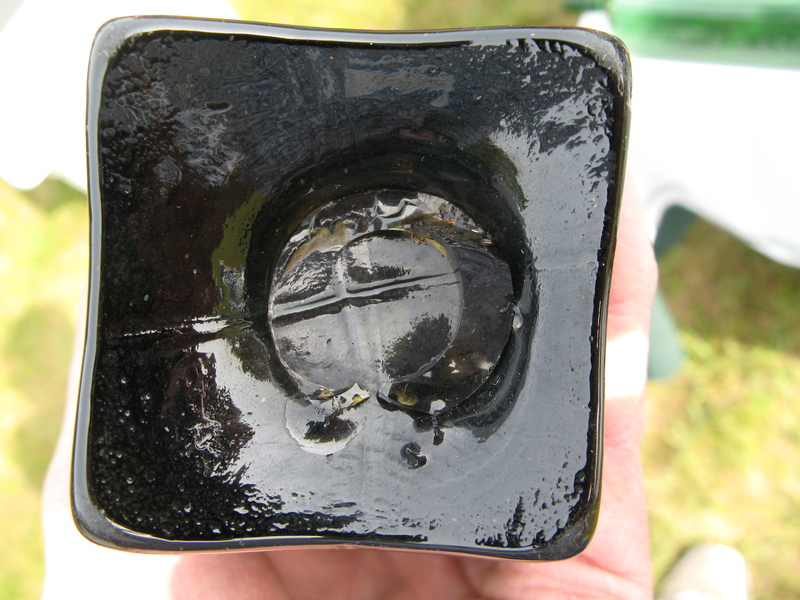 Most 19th century scroll flasks will have a pontil mark (sometimes pontil scar) on the base. These will most always take the form of a ring of glass (“open pontil”} or a grey metallic circle (“iron pontil”) Collectors place a value on the quality of the mark – large and bold marks are considered to be more desirable. Look carefully along the medial rib of the flask for signs of cracks or bruises. It can be difficult to see cracks especially when the glass is thin. Be sure to hold the bottle up to the light and rotate it slowly looking for lines in the glass which change as you move the bottle. Also inspect the base edge and mouth – these are two common areas where chips, bruises and flakes occur with use. How do you tell an original from a reproduction? Often it is not easy. I have found that the glass on reproductions is often much heavier than on an original. 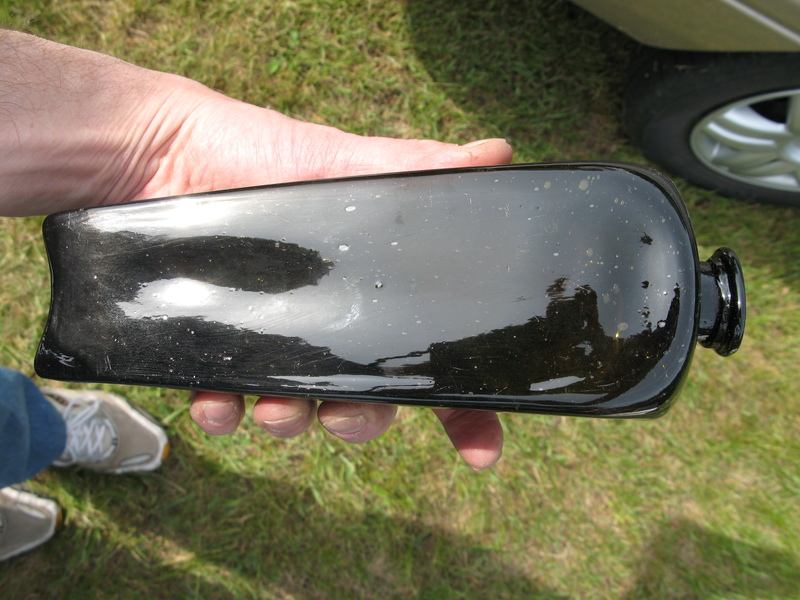 However, knowing the right thickness of the glass is a matter of experience. Another consideration is the size: I am not aware of any reproductions in the quart size – every one that I have seen is a pint. Brilliant colors should also be a clue to age; while you will see both originals and reproductions in sapphire blue and various greens, ruby red and brilliant colors should be at the least a warning sign of a modern piece. 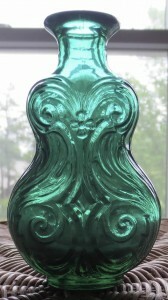 This reproduction scroll flask was made by the Imperial Glass Corporation, late 20th century. Common aqua scroll flasks will generally fall in the $50 to $150 range, depending on condition and quality. Deeper aqua hues command a somewhat higher dollar. Rare molds and better colors easily move the bottle into the $500 to $5000 range. 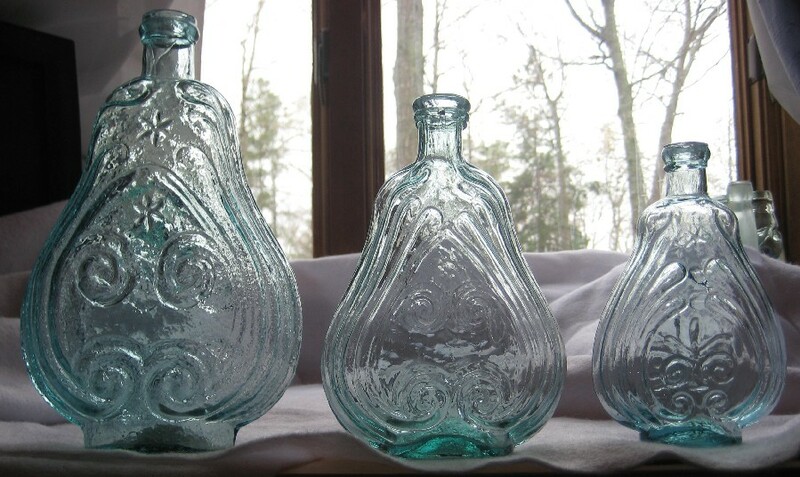 If you want to get specific about value then submit photos and details via my antique bottle appraisal service. I recently exchanged emails with John Keys after stumbling upon his bitters ingredients auctions on ebay. 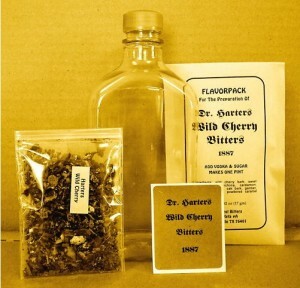 For about $10, you can recreate the 19th century experience of the bitters consumer – with great historical accuracy. His product line is called Wild West Bitters – you will receive the herbs and spices used in many of the popular bitters formulations known well to antique bitters bottle collectors today. 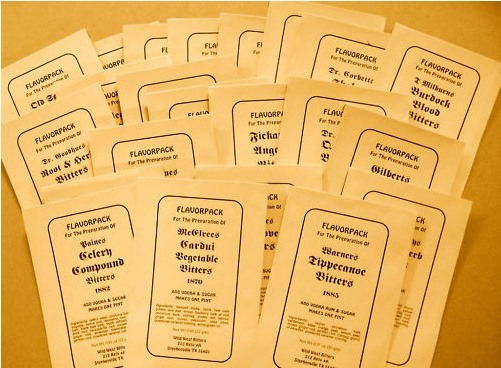 The unique ingredient packs from Wild West Bitters make it possible to reproduce, in one’s own kitchen, many of the bitters that were sold in the patent medicine era of the late 1800s. The product line is the result of 40 years’ research on the part of John David Keys of Stephenville, Texas, who felt that antique bottle collectors and many others might find it fascinating to experience just what was originally inside those bottles. Keys scoured through distillers’ formularies, pharmaceutical dispensatories, period advertisements, medical writings and judicial reports in his quest for reconstructing the formulas, or recipes, for the bitters. 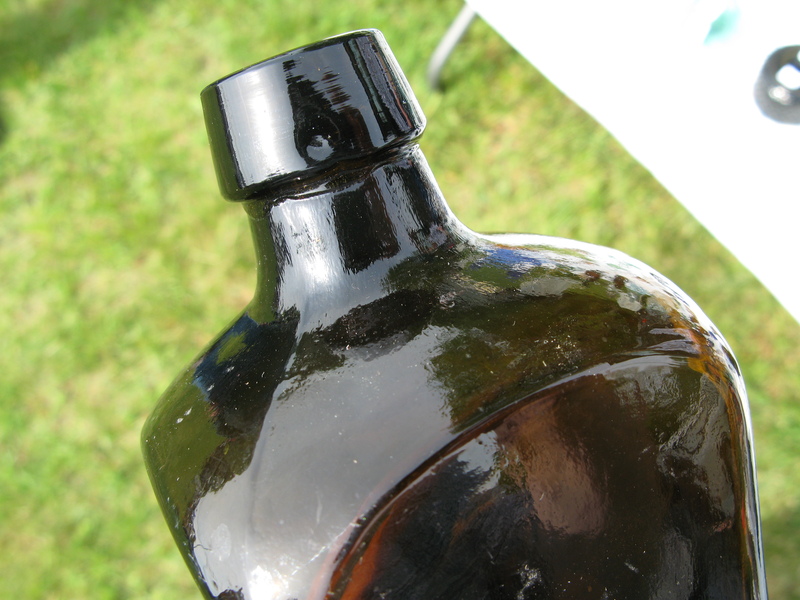 Chromatographic chemical analysis of rare surviving bottle contents was also employed. Lastly, Keys relied on subjective assumption for many of the bitters. Claimed originally as having miraculous curative powers, most of the patent bitters of the 1800s were in reality simple stomachic digestives. In fact many of them were consumed as “recreational” beverages, much like Jägermeister is today. The bitters that can be prepared from the Wild West Bitters ingredient packs are intended as “recreational” beverages, and no medicinal properties are implied. Keys himself regards the line as “history you can recreate, experience and share”. 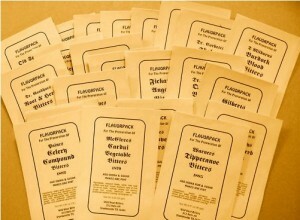 Fifty varieties of Wild West Bitters ingredient packs are available exclusively on eBay. Wholesale sales are offered for 12 of the more popular items. 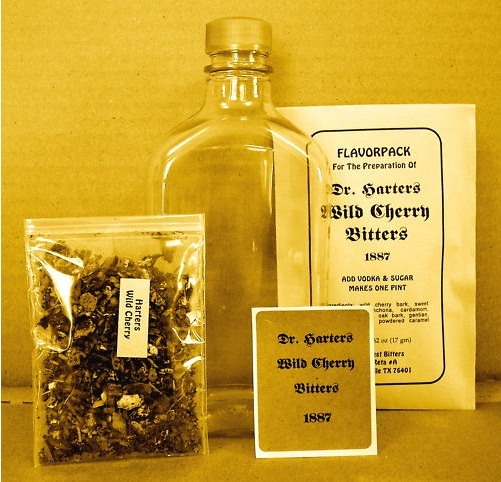 For example, The Dr. Harter’s Wild Cherry Bitters is based on an 1887 formula whose ingredients are: wild cherry bark, sweet orange peel, cinchona bark,cardamom, canada snakeroot, gentian, cinnamon, cloves,powdered caramel coloring, bitter almond oil (natural benzaldehyde). 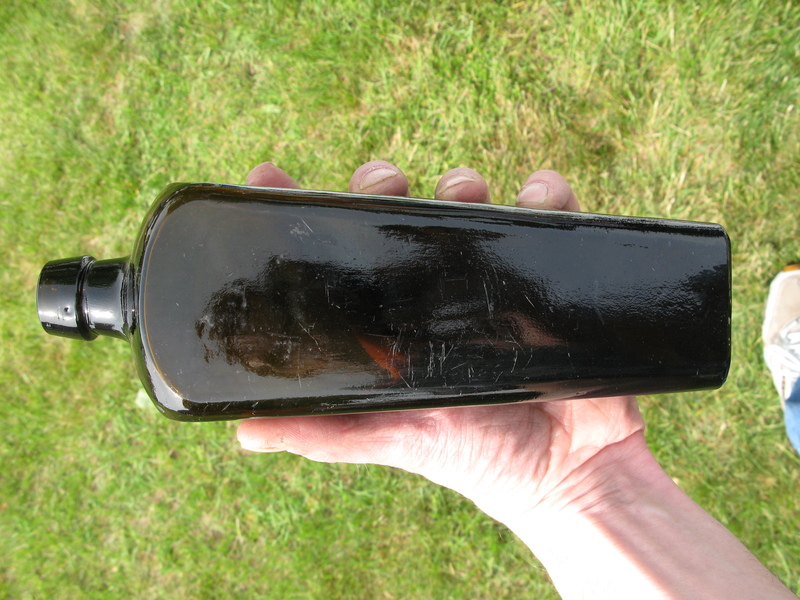 This exceptionally large square cabin-shaped bitters bottle is modern. It was made in the 1970s for a North Carolina furniture company for use as a lamp. Most are found with a hole drilled in the base. They are usually seen in amber but also occasionally green. The bottle reads DOC DUNNING / OLD HOME BITTERS / GREENSBORO N. CAROLINA on three of the four indented panels. 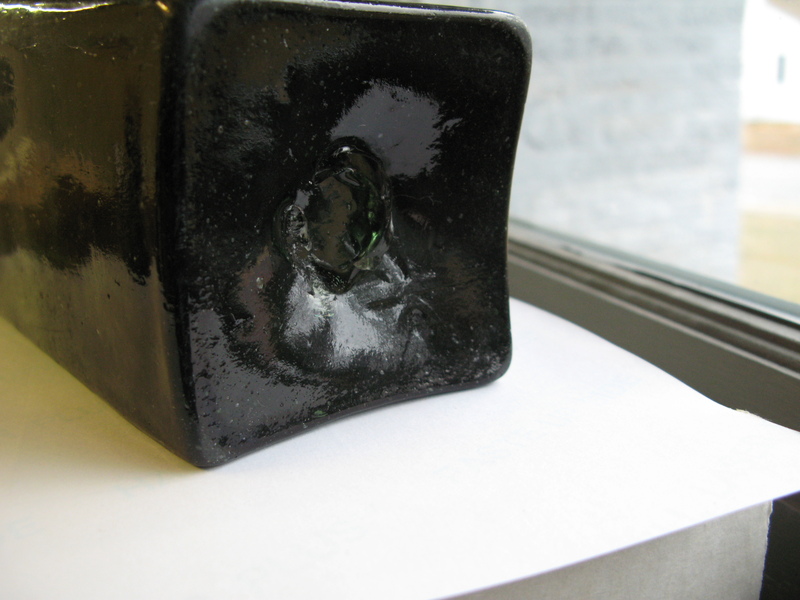 It is about 14″ tall with a 5″ square body. You will find in listed in the Ring/Ham Bitters book as O34. They are attractive and do make a nice lamp, but they are not particularly valuable. Figure around $50 for a drilled example; more if undrilled. 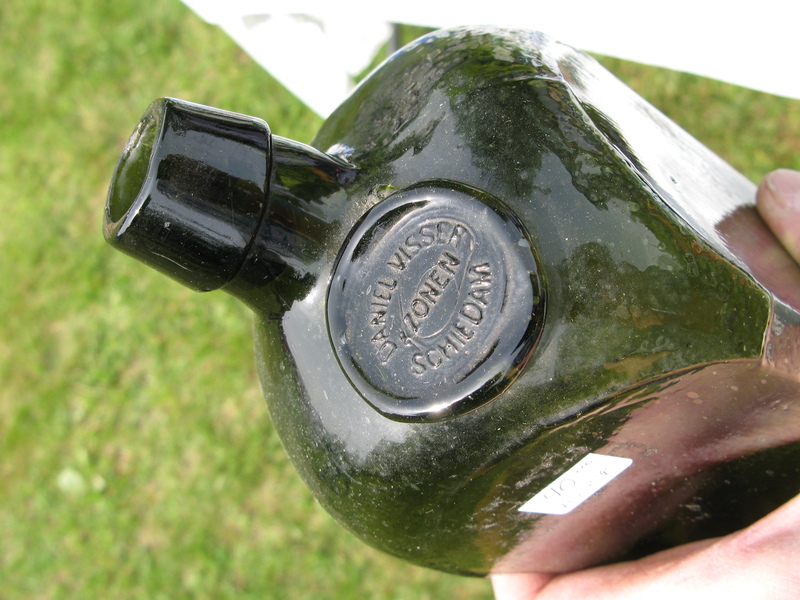 This is a reproduction of similar bottles with similar embossing. 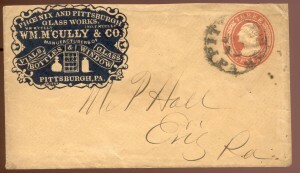 First is O35 which is embossed OLD HOME BITTERS / WHEELING, W. VA. / LAUGHLIN & BUSHFIELD. This is an amber cabin which is around 10″ tall. Second is O36 which differs from O35 only in that it is marked LAUGHLIN / SMITH & CO. This is apparently the earlier of the two original bottles. 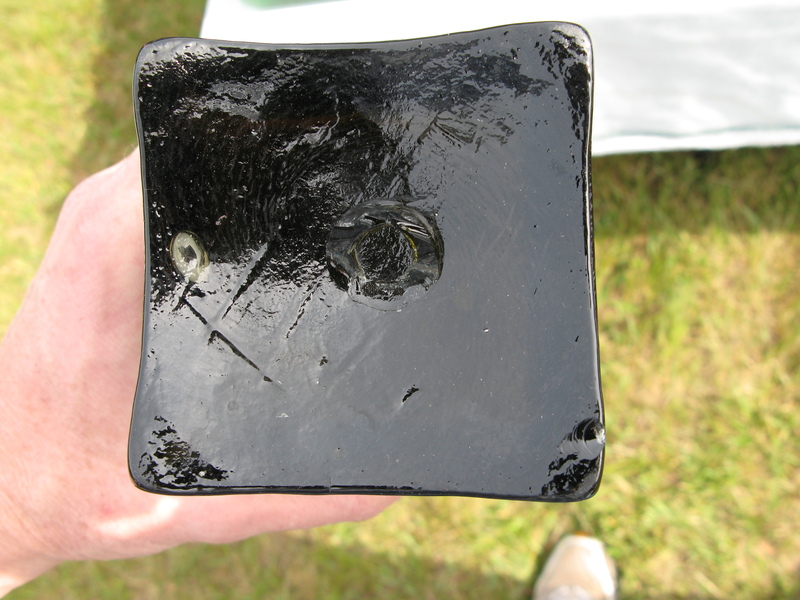 This is also found in amber and is a bit under 10″ tall. These two original bottles are worth $1-4 thousand. I’m sure Mrs. Charlotte Winslow would be a popular woman in any era – who wouldn’t be if they were famous for dispensing a morphine laden medication that was sure to soothe…and get you entirely stoned in the process. You will find plenty of discussion of opiate addiction in the 19th century – thanks to the institutionalization of the drug into medicines and other products. 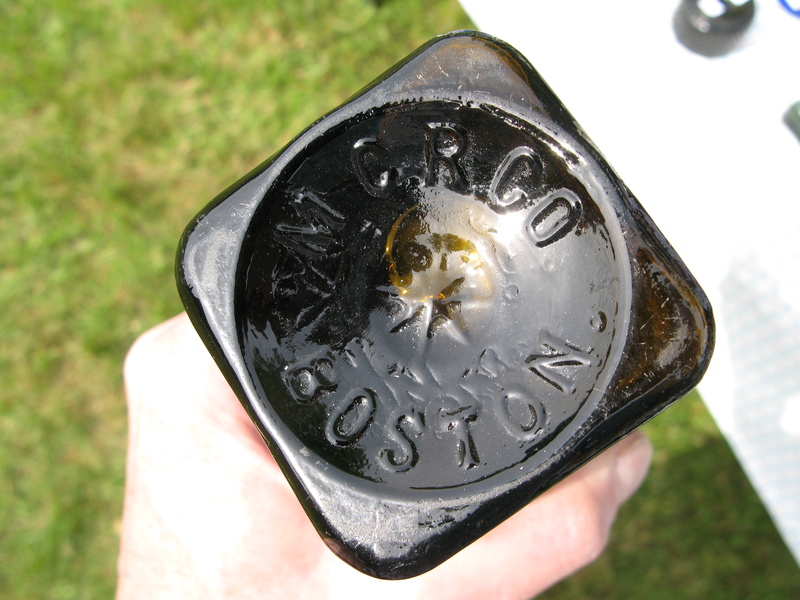 Common to bottle collectors are the cylindrical vials marked “Mrs Winslows – Soothing Syrup – Curtis & Perkins – Proprietors” which are about 5 inches tall and about 1-1/4″ in diameter. 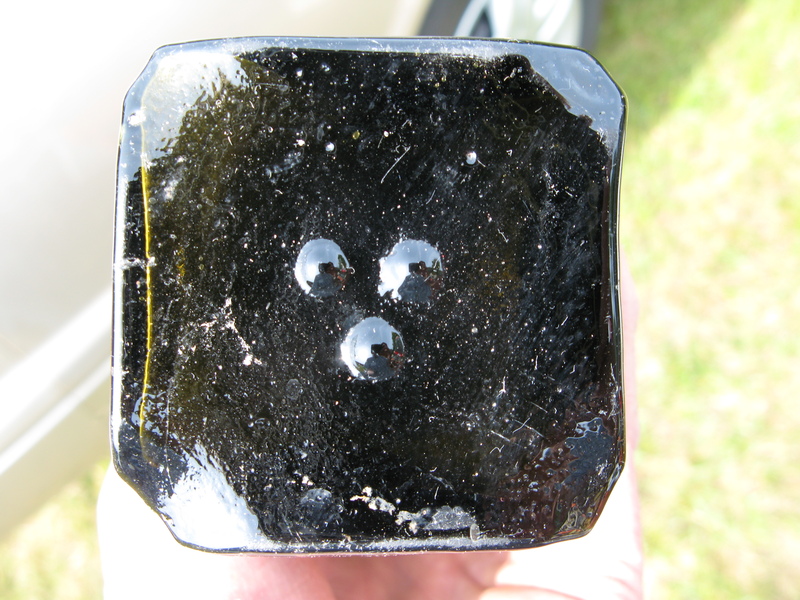 They are found with both an open pontil mark as well as with a smooth base. Earlier examples have an inwardly rolled lip which later became a better formed tooled square lip. Curtis and Perkins were druggists in Maine who became the agents for this medicine in the 1840s. They later moved their operation to New York City in the 1850s. Various agents continued the product into the 2oth century. No doubt the Pure Food and Drug Act forced its retirement it in short order. Pacific Medical and Surgical Journal, 1873 reports a Providence, RI death by ingestion of Winslow’s Soothing Syrup. There are 43 molds in the Masonic flask group. There are 30 flasks in the sunburst group. There are 52 in the Scroll group. There are 43 molds listed in this group. There are several unlisted flasks known. Includes over 90 flasks. Flora Temple, Horseman/Hound, Sheaf of Wheat, Baltimore Glass Works/Anchor and others. These are mostly flasks with embossing indicating a particular glass works. 28 molds. 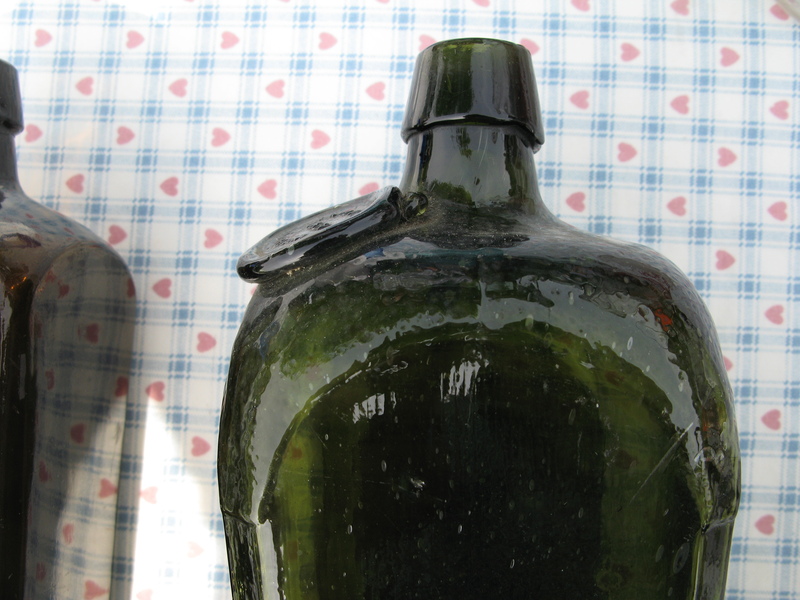 For bottle collectors, this one is something of an oddity thanks first to the odd word “Canchalagua” but also to its shape. Sizewise, the body of the bottle is a bit larger than most rectagular patent medicines and to the trained eye it will stand out from the crowd. The embossing is A.L. SCOVILL (side) / DR. A. ROGERS / LIVERWORT TAR / & CANCHALAGUA (front) and CINCINNATI (side). 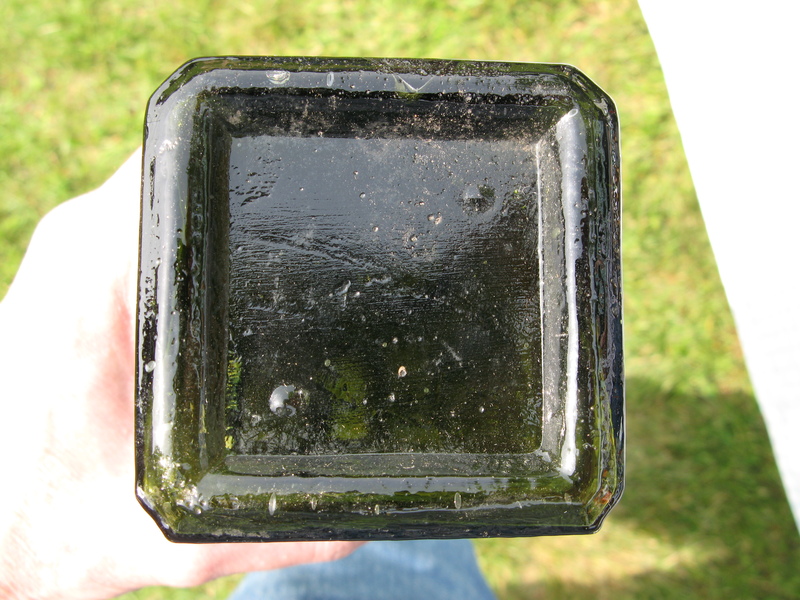 Examples of this bottle are found with both smooth base and with pontil marks. Those with the pontil mark are embossed with NEW YORK instead of CINCINNATI. Almost all are found in aqua – a few are found in a deep blue-green aqua and command a much higher price as a result. Laura Crowley writes about Dr. J. Kearney Rogers of New York City who was marketing this medicine from the grand Gothic Hall Building in 1851. 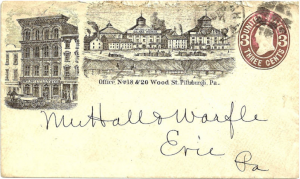 She notes the building was torn down in 1856 which leads one to wonder – was it demolished because of neglect or simply because the property had become valuable enough to put a much larger building in its place? Was this a low-rent ruse or a fashionably expensive location? In any event, Amon L. Scovill came to New York in the 1850s already a prosperous druggist and acquired several products including Dr. Rogers Liverwort, Tar and Canchalagua as well as Hall’s Balsam for the Lungs. This web page seems to contradict Crowley by stating ths Scovill and a Henry Morrill were in partnership in 1849 selling the Dr. Rogers product in New York. Unfortunately, this person does not cite a source. He goes on to say that Scovill seems to have exited the firm by 1862 and returns again in 1867. This leads me to wonder whether the smooth base bottles which are marked Cincinnati are perhaps from this 5 year period – perhaps Scovill returned home and marketed his product for a time? John F. Henry took over the brand in the early 1870s. Apparently, the company changed hands at least once again because I found that in 1919, the Williams Company of Cleveland, Ohio was charged for having shipped a case of this “misbranded” medicine. Federal authorities seized the shipment, claiming it was misbranded as specified by the Pure Food and Drug Act of 1906. Analysis of a sample showed that it consisted of “a sweetened aqueous solution containing small amounts of plant extractives, tar extractives, salicylates, alcohol and glycerin.” Apparently, the company got in hot water over their claims to “permanent relief of those Affections of the Throat, Lungs and Liver” ie. suggestive of a cure which was not allowed under the Act. I do not know how long the product remained in production, but would not be surprised to find that the Federal inquiry led to its demise. – In 1901, The Pharmaceutical Era reported that this product cost $1 per bottle or $7.50 per dozen. – There were three pontilled (New York) examples in the Sam Greer collection – Lots 1468, 1469 and 1470. 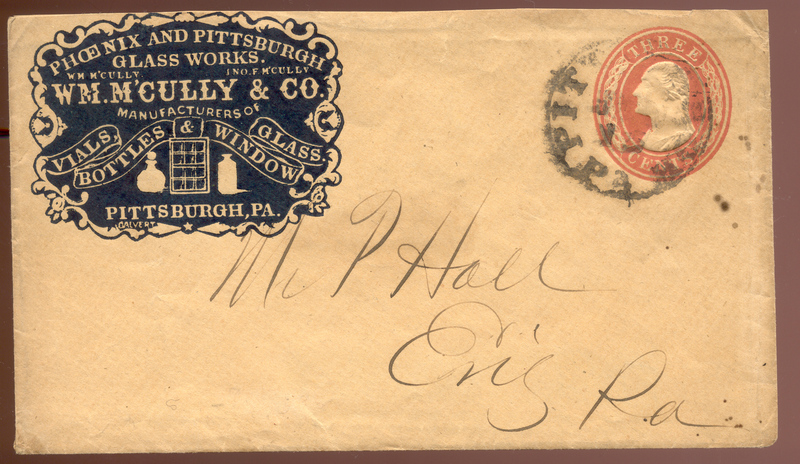 – Examples are found embossed with both “NEW YORK” and “CINCINNATI” on the side panel. – Most bottles are aqua. A few are known in a deep blue-green aqua color. – Liverwort (Hepatica americana) is known an herbal remedy for liver disorder, indigestion, coughs, lung and respiratory issues. Here is a modern liquid extract of the plant offered for sale. – Canchalagua is a South American plant is an herbal remedy regarded for its affects on blood, liver and kidney functions. I found what seemed to be contradictory references as to its botanical name – see this page for more information. So what exactly is a SQUARE bottle? Quite simply, it is one with a body which has a square cross-section, or, in other words, it appears to be square when looking down on it from immediately above. 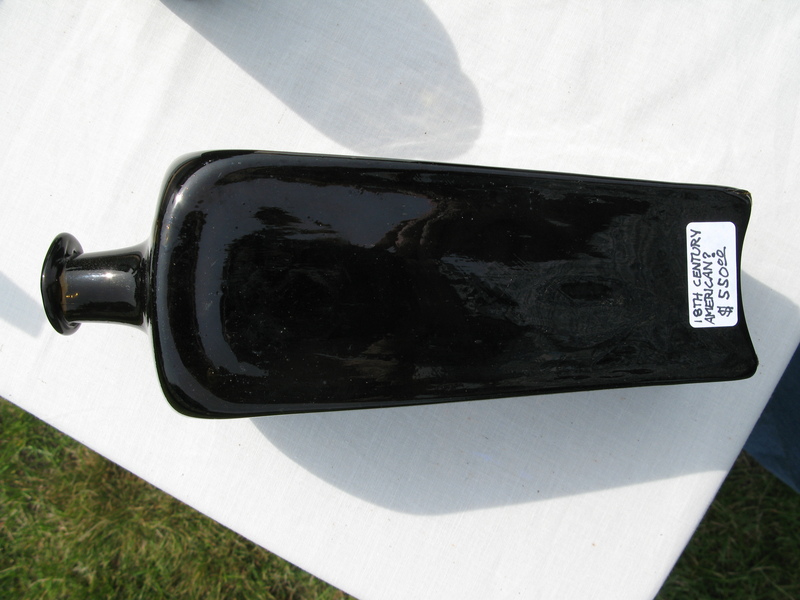 The square shape was adopted by many manufacturers of bitters. Perhaps it was precisely because of the great fame achieved by two such companies that so many felt compelled to imitate the form. Those two products are Lash Bitters and Hostetter Stomach Bitters. One might also include Electric Bitters in this short list, but the bottle is a bit different in that it has recessed panels. The square bitters bottle is plain and simple utility. There are no fancy adornments in the molds and certainly economy was the word. The men behind these popular products were eager to sell their product in great quantity and reap the profits. Perhaps they knew that good days of selling high-alcohol content “remedies” would not last forever. 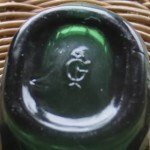 It is interesting to consider this bottle type in contrast to the many antique bitters bottles which are so fancy in form – bottles whose form defined the product, its desirable status and no doubt its expensive price tag. Donald Yates (PDF file) has put together a good synopsis of this company (Bottles and Extras, Winter 2003) which was in operation in various holdings from 1850 to 1966. Interesting, it is a Western Bottle – the company began in California – before expanding to offices in Chicago and New York, and then consolidating in its final years in Passaic, New Jersey. 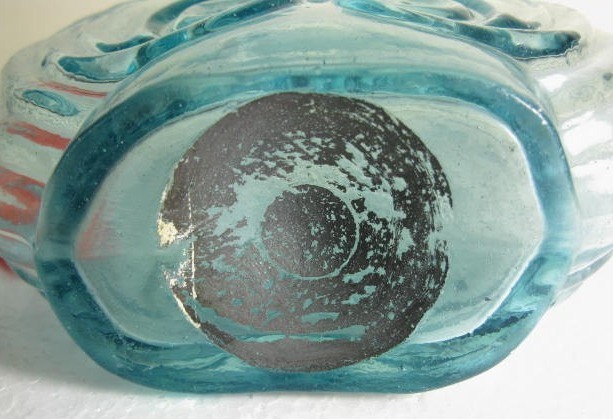 I am off to the “New Hampshire Glassmakers: 1780-1886” symposium this weekend – really looking forward to this. 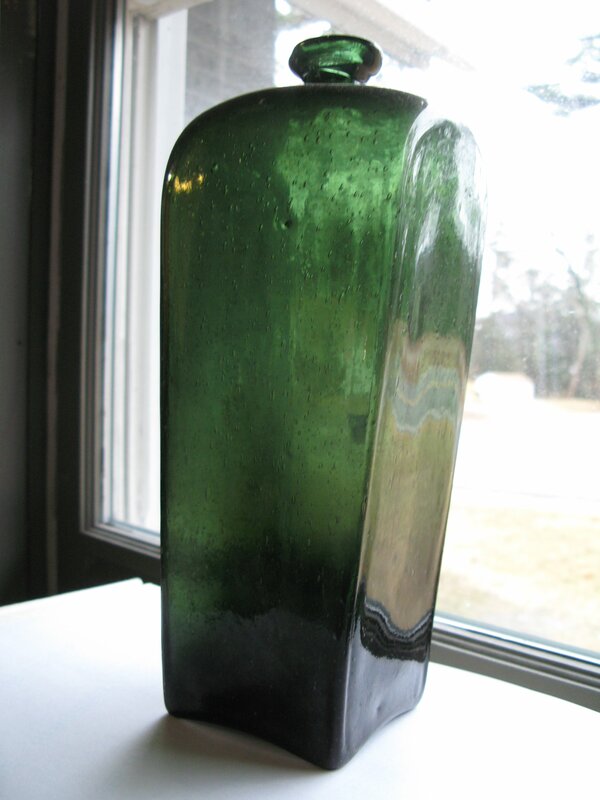 Case gin bottles, also known as taper gins, were a common style used from the 17th through early 20th centuries. The body is square in cross section and in all cases will taper from a wide shoulder to a narrower cross-section at the base. 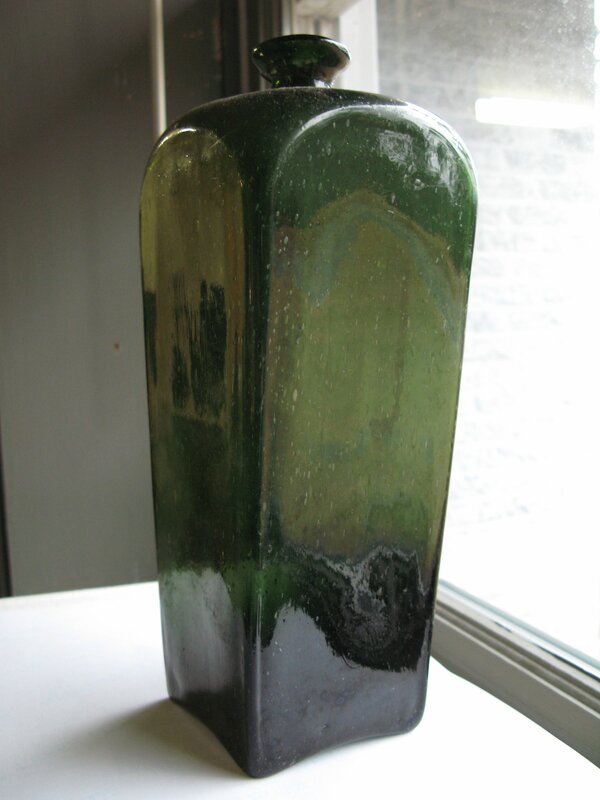 This form is almost always found in olive green color ranging from translucent to opaque. On occasion, you will encounter examples in clear and other green hues. Other colors are rare – I have seen an example or two in cobalt blue over the years. For an superb review of facts and references related to case gins, see Bill Lindsey’s liquor/spirits bottle page. Scroll way down to the Case Gin section. 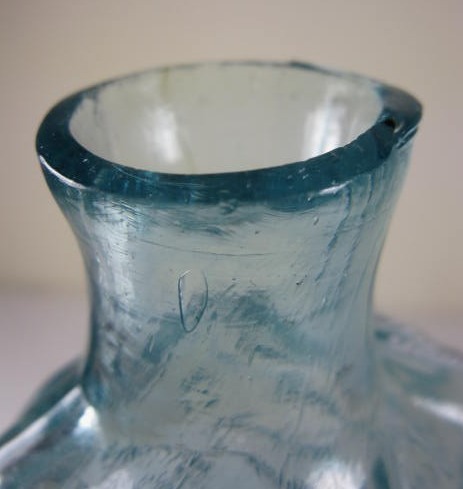 Dale Murschell’s book on Wistarburgh glass discusses case gins made at this 17th century glassworks in New Jersey. As Dale states, Wistar advertised the form for sale and they were listed in his Will Inventory. He shows many fragments and examples and discusses attributing form variants to the factory. In short, Wistar examples are thought to be those which are quite boxy in form with a very square shoulder and a pronounced arc across the base edges. This is a simplification of the data so be sure to consult with Dale’s book for far greater detail. Thanks to Dale’s book and a discussion with Rick Ciralli earlier this year, I was inspired to snap a bunch of photos of gins at the Coventry Bottle Show in May. There was a great selection of case gins there including a period chest full of gins. William McCully and Company Glassworks in Pittsburgh, Pennsylvania manufactured bottles in the mid 19th century. Bottles found with the embossing “McC & C” or “Wm. McC & CO” can be attributed to them. 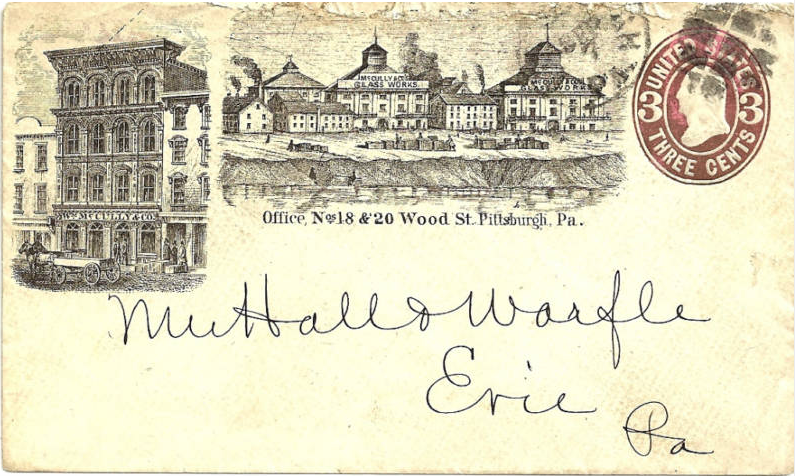 Here is an envelope from the business which has a really fine engraving of the company office as well as the manufacturing buildings. Click to enlarge.